Does DeMarcus Cousins’ quad injury improve his chances to re-sign with Warriors? When DeMarcus Cousins crumpled to the floor, gripping his left thigh Monday night, the immediate thought was that he played his last game as a Warrior. One day later, the MRI results confirmed the news the Warriors feared: Cousins tore his left quad, likely ending his first season with Golden State 30 games in. Last year, Cousins was on his way to the best season of his career, with averages of 25.2 points, 12.9 rebounds, and 5.4 assists. He was primed to sign a super-max deal as he entered free agency. Then he tore his Achilles in late-January, which changed everything. Cousins received minimal offseason interest and opted to sign with the Warriors for a one-year, $5.3-million salary, one of the most team-friendly contracts in the league. The hope, for Cousins, is that he would recover and play well upon returning to the floor, opening his possibilities for the lucrative contract he craved one year earlier. That, of course, has gone awry now that he faces another lengthy rehab. The Warriors will turn to Kevon Looney, Andrew Bogut, and possibly Jordan Bell for the remainder of the playoffs. Losing Cousins evidently hurts the Warriors — but it may help them in the long term because they can potentially afford to re-sign him. His rising value from a solid 2018-19 campaign has depreciated with his quad injury. Similar to last summer, teams could be scared off by his current injury. Cousins is now working his way back from two serious injuries to his left leg. Klay Thompson and Kevin Durant will likely demand supermax contracts in the upcoming season, and Draymond Green won’t be far from one in 2020. Durant will opt out of the final year of his deal and test the free agency waters after the current season. By multiple accounts, he will likely not re-sign with the Warriors. If Durant opts out of the $31.5 million he will make in 2019-20 with the Warriors, that will help the Warriors sign Thompson to a max deal, along with extending important pieces like Cousins and Looney. The Warriors’ center position is in a precarious place. Looney will be an unrestricted free agent, Bogut is supposed to return to Australia, and Bell is a restricted free agent after the current season. Looney, making just $1.5 million this year, is 23 and playing the best basketball of his career. If he continues to do so, his market value will rise considerably. 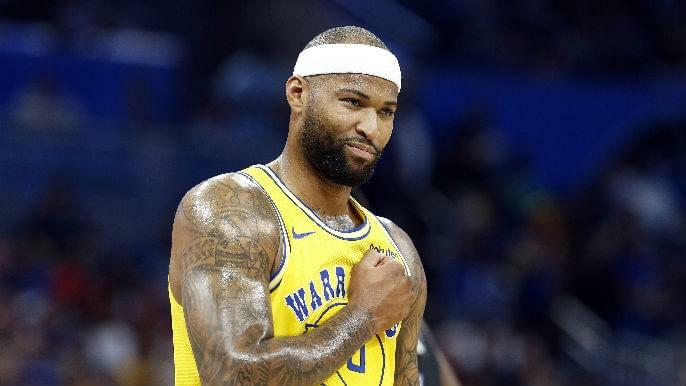 With Durant potentially out of the mix next year and beyond, retaining a player of Cousins’ caliber could be a necessary move for the Warriors to make, as they will be too cash-strapped to chase other big-money free agents while retaining their own. For Cousins, re-signing with the Warriors may be the best option, from a financial and fit perspective. There is a large enough sample size to know the Cousins integration has worked well for both sides to want to continue this partnership. The question is how other teams will value his production relative to his uncertain health. Cousins averaged 16.3 points, 8.2 rebounds, 3.6 assists, and 1.5 blocks in 30 games with the Warriors. He drew rave reviews from teammates and coaches about his soft hands, passing ability, and screen-setting. His 27.4 percent three-point clip was his worst in four seasons, but his 48-percent shooting percentage from the floor is his best average in five years. Cousins’ presence alone enabled the rest of the Warriors offense to reach another level, as opponents couldn’t disregard Cousins to shadow the other all-world scorers on the floor. The results followed. The Warriors went 23-7 with Cousins and 34-18 without him this season. When he scored at least 14 points, the Warriors went 16-3. It’s worth noting that Cousins was plus-2.2 on the season, however, and Looney was plus-3.8. Cousins played very well against some of the Western Conference’s best centers. Last month, he poured in 27 points and eight rebounds against Houston’s Clint Capela in a two-point win. Earlier this month, Cousins dominated Nikola Jokic, something not many players have done this year. Cousins produced 28 points and 13 rebounds to Jokic’s 10 points and five rebounds. But it was the way Cousins confronted that matchup that made his performance so impressive. He was the aggressor from the start and took the matchup personally. With all due respect to Looney, he doesn’t have that same mindset, impact, or upside, at least not yet. The Western Conference’s best teams are loaded with good centers, including Jokic, Capela, Steven Adams, or Jusuf Nurkic. Retaining Cousins, a top-three center in the league when healthy, would help offset the impact of those players in a playoff series. And if last year’s market was any indication, Cousins will come cheap once again. The Warriors could use the taxpayer mid-level exception on Cousins, falling somewhere between $6 million and $7 million for next season. That is tremendous value for a player of Cousins’ caliber, at a position of need for the Warriors. So, while his injury unmistakably hurts the Warriors during their current quest to three-peat, it may actually bode well for both Cousins and Golden State for next year and beyond.